We're rolling out a new cloning feature today that will significantly increase your productivity in cases where you have the same or similar types of garden beds or plantings. button; clicking the Clone button will create a copy of the graphic on the map, and populate the information in the form. There may be times where you want most all of that information to stay the same, and there may be times where you'll need to go in and modify particular details; this gives you that flexibility. When you're satisfied with your choices, click Save as usual. 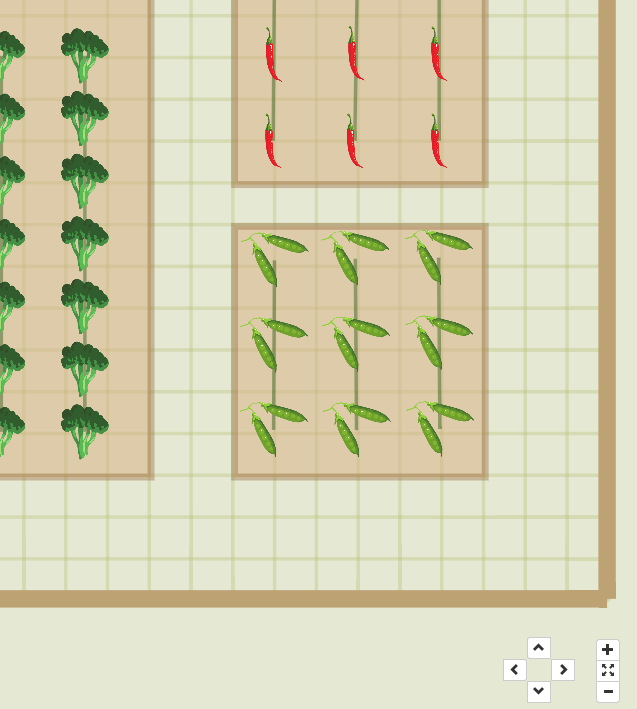 The default view of a space now shows your garden at a zoom level that lets you get a full view of your layout. See the result on the demo account's map. If you've zoomed in to see details about some plantings, you can return to the full view by clicking the Scale to Fit button between the + and - zoom buttons. Now when you zoom in/out on maps, whether using your mousewheel, the buttons on the map, or via mobile-device gestures, you won't accidentally zoom out much further than desirable. It will only allow you to zoom out to the level mentioned in #1 above. To accomplish these improvements, we're introducing width and length dimensions to growing spaces. We've defaulted everyone's existing spaces to be 50 ft x 50 ft to err on the cautious side, since this is roughly what the typical view was for users in the past. If you have a space of a different size, log in and go to Edit Account > Spaces in order to put more accurate dimensions for your spaces. While viewing the map, if you're interested in seeing the boundaries that you specified, click the Show Grid checkbox, and pan around; you'll notice that the right and bottom borders of the space are outlined for your reference. You'll also notice that the boundary doesn't limit you from where you can pan to, or where you can put plantings; it's more a visual guide and a tool for preventing excessive zooming-out.